Shop the Best Price Beds range of Mammoth beds and mattresses for outstanding comfort for a great nights sleep. Mammoth beds and mattresses use high grade medical foam, which is not memory foam. Its unique feel offers a revolution in sleeping technology and helps promote a deep healing and soothing night’s sleep. The Mammoth medical grade foam has been endorsed b... Read more >y the Chiropractic Patients Association, the Department of Health, and the National Institute for Clinical Excellence. Medical grade foam has been used in hospitals and clinics for years to give patients the best conditions for healing during sleep. The Mammoth range brings this technology to your home, where you can benefit by getting the best sleep whether you have a chronic condition, or you simply want to get the best night's sleep possible! Unlike memory foam the high specification medical grade foam is not heat reactive, meaning it reacts the same whether the sleeping environment is warm or cool. 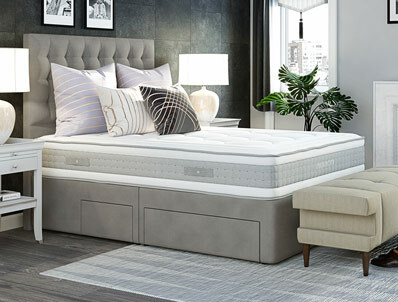 It also does not trap heat in the same way that memory foam can, meaning that these mattresses allow you to sleep in a cool, comfortable position.